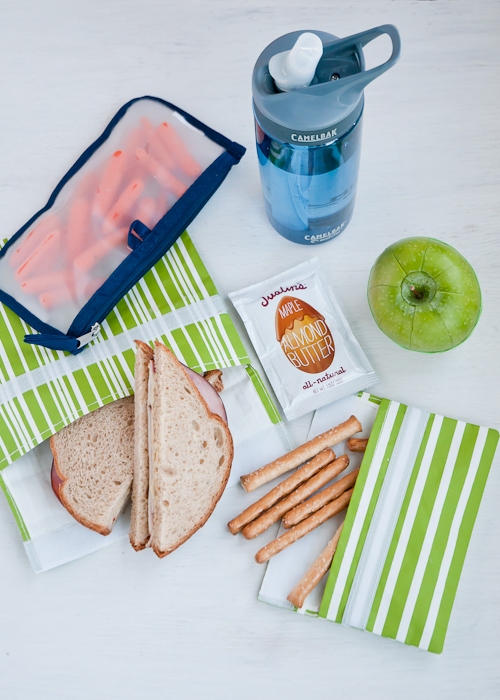 Today’s menu in our Lunch Box Series features another lunch menu classic: ham and cheese. The special thing about Lunch Menu #12 is that it doesn’t require an ice pack. Lots of crunchy finger foods too! If your school is nut-free, swap the almond butter for a little cup of caramel. You can usually find them near the apples in the produce section of grocery stores. You’ll find the individual packages of almond butter on the shelf near the other nut butters in grocery stores. – Hold the cut apple together with a rubber band, it helps prevent the apple from going entirely brown (it still does brown a little). We give our apples a little splash of diluted lemon juice and that does a great job of preventing the apples from turning brown. Thanks for posting the rubber band and apple trick! My kids do not like the way lemon juice makes their apples taste so I’ve had to avoid putting apples in their lunch boxes. Thanks to lots of orthodontic devices they are unable to bite into a whole apple, so this trick will definitely come in handy. This is my favorite menu yet! But I have to ask — are you sure you shouldn’t use an ice pack with a ham and cheese sandwich? All of our deli ham packages say to refrigerate! Thoughts? The rubber band on the apple! Brilliant!